How long before I can walk on my newly coated floor? Can you apply Prestige’s Coating over an existing coating? I see you offer a Lifetime warranty on residential applications but only a 2 year warranty on commercial. Why is that? What is a safe skid resistance? Does the concrete need to be cleaned before you apply the coating? Does your company install garage cabinets as well? Approximately 3 hours for a climate controlled area. Each case is different, however we recommend 5-7 days around 77 degrees before driving your vehicle on the coating and to place cardboard, carpet or something similar under the tires temporarily. Technically the coating cures just like concrete and needs 30 days to fully cure. After that time, the cardboard, carpet, etc is not necessary. Technically yes, but our coating actually searches out the moisture in the concrete and bonds itself molecularly to the concrete. So we would need to remove the existing coating so that our coating can penetrate the concrete. This is why the only way our coating is coming up is if the concrete itself comes up. It is possible as we cannot warranty acts of God, but, our coating contains a rubberized membrane that has over 600% elasticity. The coating will expand and contract with the concrete over the years and seasonal temperatures therefore greatly minimizing the chance cracks will develop or reappear. When you purchase an expensive appliance, like a refrigerator, and only receive a 1 year warranty on it, that does not mean it will only last one year. We only offer a 2 year warranty on commercial applications because if a defect were to occur it would happen in the first 2 years. Since we have a great selection of anti-skid additives to add to the coating, we can make the floor as smooth as glass or rougher than concrete. It depends on what the customer is using it for and their own preference. Our coating with low to medium amount of anti-skid is traditionally cleaned with a mop with water, or water/vinegar mixture. If you add more aggressive anti-skid, a broom will need to be used in place of the mop, everything else stays the same. Yes, we ask that the floor be swept clean of most debris before we arrive. Generally 2 days for a 1-4 car garage. No, there are many types of coatings available and all grades of coatings are not the same. Prestige Garage Floor Coating uses only industrial grade materials which include only the highest quality resins. 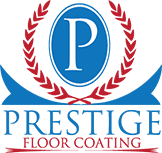 The coatings applied by Prestige Garage Floor Coating provide the highest adhesion properties resulting in long lasting durability. We install simple garage storage systems, but we have found that if we specialize in one product/service, we can focus all of our energy in producing the best product and service available. If you need a fully customized garage storage systems, we partner with highly reputable garage cabinet companies and would be happy to refer someone to you.